There are many ways to create art. We are excited to bring to you a fresh approach with our ‘Papier Mosaic’ style paintings. We’ll share basic application and design techniques to achieve the best results. Learn how to incorporate a variety of paper and search for the unique color nuance it has to offer. [It is like painting with paint that has ‘personality!] 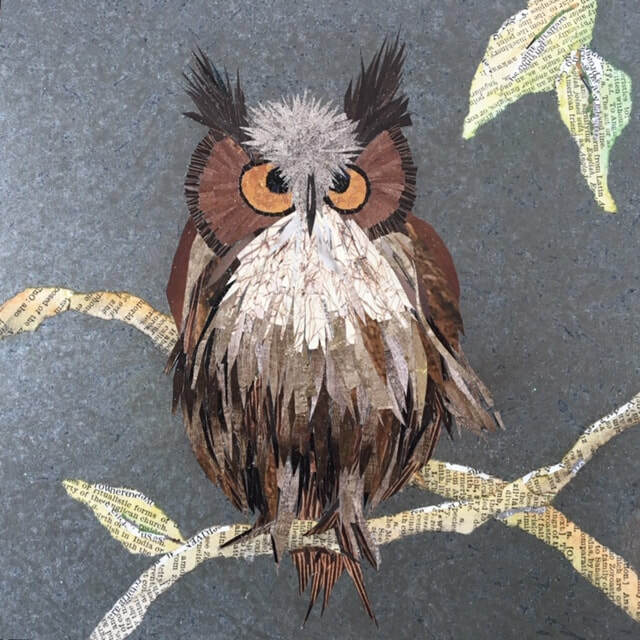 We’ll learn how to use each element of paper to incorporate character and help us build your unique artwork. All materials will be supplied… simply bring your passion to create and we’ll help you bring your art to life. 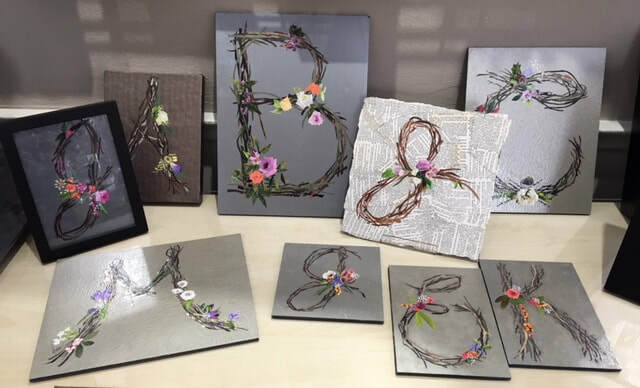 One of our most popular classes are creating 'Initials'. These amazing creations can be personalized to each person. We are working on fresh new ideas for topics to coordinate with your favorite letter of the alphabet! In addition to the popularity of this class, it is also a great class for the person just starting out... we will achieve excellent results for your first project. The metallic painted background sets this 'Initial' apart. By pre-painting this canvas, we save you time in the building of your artwork. You are able to focus only on the structure of the letter. Exquisite results are achieved by layering the branches and then selecting the perfect floral colors to complete your design. Imagine how a Mary, Melinda, Meg, Michelle or Molly would love this for a gift! ​This letter 'E' has very pretty curves and is set against a warm gray metallic background. All the flowers are totally adjustable... you are able to include whatever flowers and colors you wish to make this customized to your own personality. ​In this class we begin looking at how to construct flowers with paper. This painting may take a little longer... however, we'll take you through the process step-by-step so you will be please with the results. When complete you will be able to frame this art to showcase your talent. This makes a lovely gift for that perfect someone! ​Our Coneflower on Antique Dictionary Paper is one of our most popular classes. You will begin by selecting those pages from our special dictionary that are most important to you. You'll then paste them onto a special board. Soon you will be constructing your flower upon the background. There are several flower designs from which to select. The finished size is 8" x 8" and will fit into a standard frame. This is a lovely work that is a perfect first class! Our 'Pear Painting' is a favorite art project. We begin to explore the use of color to create light and dark areas and to begin to 'form' the shape of the pear. It is very exciting to incorporate the correct little bits of paper to convey a personality in your subject. When you look closely you will find little elements of lace, flowers, nature and textures used to build the shape and composition of the fruit. I could spend hours looking for all the perfect colors to use. We want to share with you how to get lost in your art. When viewing the actual Paper Painting this design appears very complicated. We will teach you how to paint with a brush and make this an achievable element of art for you or for a friend. This take a little longer to achieve than some of our paintings; however, you will learn how to build flowers with paper and create truly beautiful works of art. We promise you will be amazed with what you are able to paint. The canvas is pre-painted with a lace design, so we will need to plan ahead if this topic is your choice of art. It is worth the extra time to paint a truly extraordinary floral composition. The sky may be done in paper or paint. If you'd like to create the sky in paper that will take more time to build, yet, it is very rewarding. 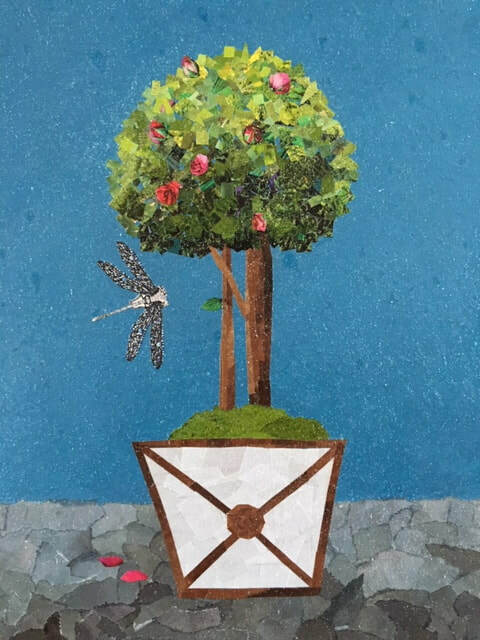 The picture illustrated has been done with a metallic painted sky... this allows the artist to begin almost immediately on the topiary composition. This image is a classic... it has the look and feel of a French garden. Many components may be added or deleted. You are able to create a background of flowers or a fence... the choice is yours as the Artist! One of my favorite creations is this beautiful and colorful Apple. Look closely and you will see many other colors than those that you would expect to see in a Granny Smith. Full spectrum color is the perfect way to colorize our art... by incorporating the rainbow into your composition you will add personality and interest to your own apple! Touches of pink, orange, yellow, blue and violet all make an appearance in this painting. These blueberries are so incredibly 'painterly'. They have the feeling of an Impressionist era painting. Tiny bits of paper in light and dark shades and in cool blue colored papers make these berries incredibly interesting. Creating the look of shadows adds to the dimension of these berries. ​This cherry has a pretty shine, achieved with white paper. Searching for all the perfect shades of red made this be a very exciting challenge. The four pieces of fruit that I have included are all part of one collection. This was a commissioned work for one of our Clients. We are excited to share our expertise with you so that you could create your own art in the fruit or vegetable of your choice. ​This lemon was a sweet joy to create. Lots of little bits of different yellows and golds were used in the creation. You are also able to see colors of greens and violets that appear making this more interesting to me than a monochromatic color scheme. ​So many people select this bike to create. Each time it turns out different and personalized to the individual. As you can see each part, the sky, the stone fence and the grass are all done in paper. This is a fun project.